Having not updated in a while, I’m coming back with some hopefully useful features for Graphsy. First just want to reassure everyone that work on embedding graphs is progressing nicely and should be done soonish. I also took some time to add alignment tools. I felt they were missing and wouldn’t take me too long to code up. However, with all the traveling and getting sick I’ve been doing the past couple of weeks, these features took a bit longer than anticipated. Also not sure how well they will scale in the end. It seems to work fine for 100 shapes, but there is probably a point when it will crap out on certain machines. Let me know if it happens to you. You will noticed a new toggle button that is turned on when logging into the studio portion of the application. It enables objects to be snapped and aligned depending on other objects in the scene. 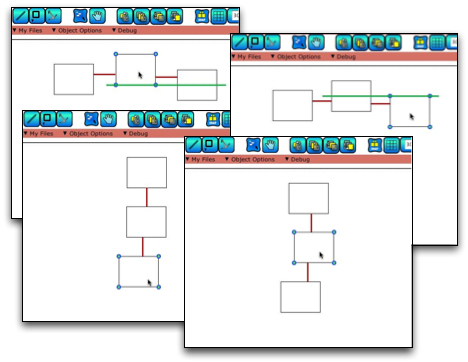 At their simplest, the features will align top, middle, bottom, left, center, and right portions of each object to other objects in the scene. 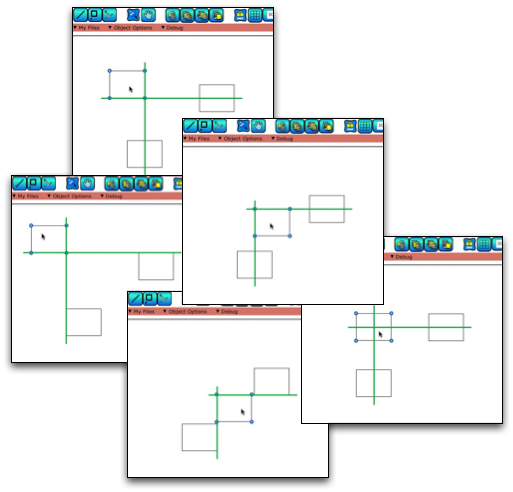 Graphsy will show what objects are aligning together using a green bar. Graphsy will also align objects based on their distances. For example, if you want to place three boxes such that they are displaced by the same amount, you can begin by placing the first two. Then the third will snap into place at the same distance from the second as the second is from the first. Also, when placing an object between two other objects, it will snap into place right in the middle. In this case red bars will appear to signify which distance is being used by Graphsy. I hope you find there features speed up positioning and help you create better looking images. If you find that snapping is getting in the way, you can turn it off by clicking on the toggle button. This is something I’ve been meaning to write about a quite some time now. It is one of the things that most irritates me about how Software Engineering (SE) is presented to people unfamiliar with the concepts. It tends to be compared to other forms of engineering, especially architecture. I have to admit that when first being taught SE, I fully bought into that whole analogy. But, when one moves beyond the basic concepts, it falls apart. There are many problems with this comparison as well as many pitfalls one may fall into when making it. The third day was the least eventful. There was a single session and a keynote. Unfortunately we had to leave before the keynote so I only attended the session. There was one great presentation and two that seemed like they were getting at something, but didn’t make much sense at the time. Will read the papers and hopefully understand them better. I had an update ready a few days ago. Originally this was going to add undo/redo functionality. I know I said layouts were going to be next, but then my wife played with Graphsy for a bit and pointed out that there was no undo and yet there was an auto-save. That made it difficult and punishing to try out different things. So I put together the undo feature, which was surprisingly not that difficult. That was a few days ago. You are currently browsing the Graphsy Blog weblog archives for September, 2008. Entries (RSS) and Comments (RSS). 31 queries. 1.001 seconds.